Reclaim Hosting provides free SSL certificates for all users through the Let's Encrypt project. To get started, login to your 'cPanel' and click the 'Let's Encrypt' icon located under the 'Security' section. The interface will list all of your domains with those secured with a Let's Encrypt certificate at the top. 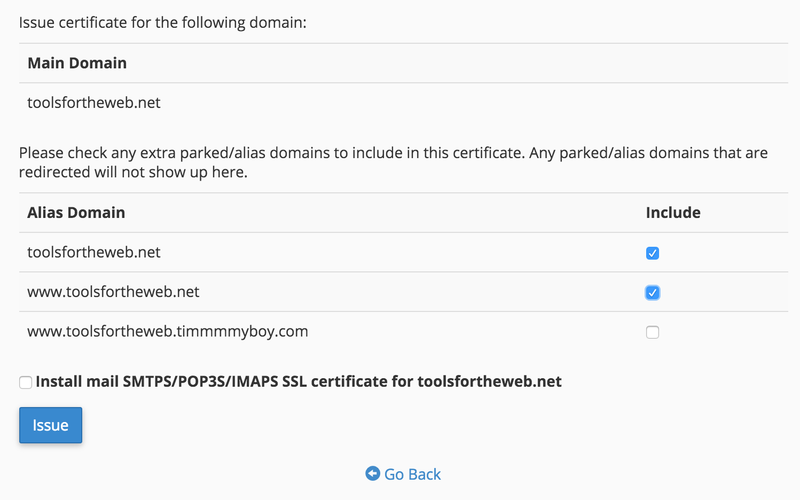 To install a new certificate for a domain click the Issue button next to the domain name. If you would like to use the same certificate for subdomains, like www, check the box next to each one that should be secured. Once you're ready to go, click the 'Issue' button at the bottom of the page. If successful, the domain will be secured with a free TLS SSL certificate provided by Let's Encrypt. The Let's Encrypt HTTP Challenge Failed - This error can occur if the domain you are attempting to install an SSL certificate is not currently hosted with us. Let's Encrypt attempts to verify domain records by reading a file placed in the root directory of the domain. If the domain is not resolving to our servers this test will fail. If the domain is hosted with us and you are still encountering problems, please contact us for support. I added SSL but my site still shows http - Adding a certificate only provides the option to load over SSL, but doesn't force it on the server. For information on how to setup your site to run exclusively over https see this article.